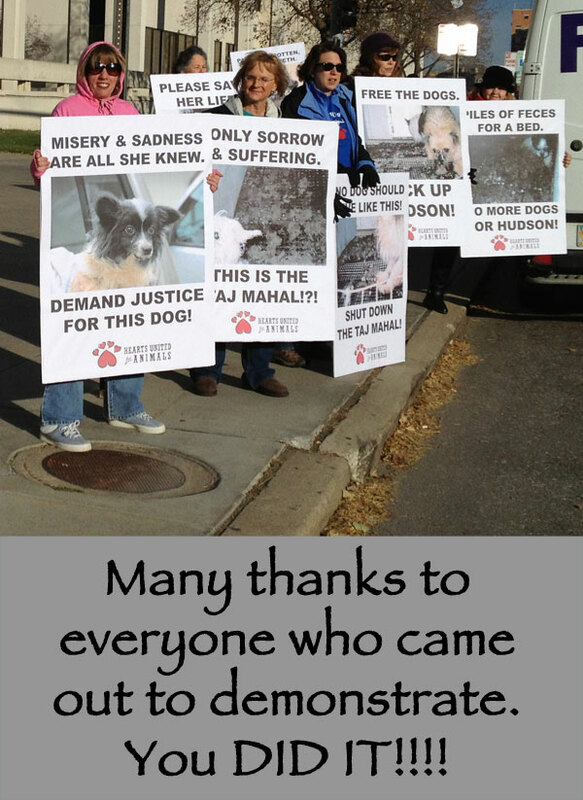 We wish to extend deep gratitude to all of our supporters who wrote to the Lancaster County Attorney regarding the Taj Mahal breeding kennel in Malcolm, Nebraska. Today your voices were heard. Julia Hudson was sentenced to two years probation (the maximum) and during that time she will not be allowed to own, possess, reside with or raise any dogs. She will be subject to searches of her premises, her person and her vehicle at any time. She has also been ordered to pay restitution to Hearts United for Animals for the expenses associated with the care of the 19 Lancaster County Rock Stars whom we rescued from her facility in April. In addition she will need to perform 120 hours of community service. Ms Hudson's attorney began today by stating that Julia Hudson's dogs were simply livestock. He stated that they are not here to be cuddled and pampered. He said they are for profit, just like hens and hogs who urinate, defecate and eat in the same small cages that afford them no room to even turn around. He said they are not pets and all she did was treat livestock like livestock, therefore she was baffled by the accusation that she had done anything wrong. He also stated that he did not feel that Ms Hudson should have to pay restitution for medical expenses incurred by Hearts United in saving the dogs. He said that if they were in bad shape they should have been euthanized in order to save money. He stated that the demonstrators "just" had a moral objection and were too emotional. The prosecuting attorney did a wonderful job. He pointed out her longstanding pattern of uncorrected behavior, described her disgusting premises in detail, and listed each illness and injury found by the HUA veterinarian. He then read an excerpt of a letter from a neighbor who had encountered some of the Hudson dogs. He is a retired sheriff who stated that through all his years in law enforcement, having encountered many corpses, he had still never smelled anything as horrific as the Taj Mahal dogs. He said that he saw Ms Hudson smack a dog so hard that he had to turn his head in disgust. The prosecutor said that Ms Hudson's excuses were wearing thin and that she was clearly unwilling to learn a lesson and correct her actions. He then asked for the stiffest possible sentence. The judge began his remarks by telling Ms Hudson that what she had done was "no less than to create an animal Auschwitz." He said that an individual has to be very insensitive to think that an animal cannot feel cold, hunger, pain or abandonment. 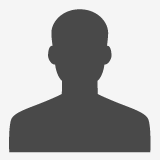 He pointed out that she offered no apology, no admission of wrongdoing. He told her that she was a person driven by money and that it was clear that nothing else mattered to her. While he could have imposed jail time or a fine that would not have kept her from owning animals, and he realized that would be the most beneficial sentence. We applaud Judge Timothy Phillips as well as prosecutor Corey Rothrock for their fine efforts and good judgment in this case. 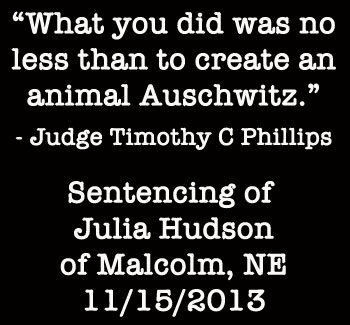 Julia Hudson, owner of "The Taj Mahal" breeding kennel in Malcolm, Nebraska is being sentenced on November 15th, 2013 for cruelty and neglect of animals. Hearts United for Animals rescued 19 dogs from her breeding facility in April of 2013. We have already held one well-publicized demonstration to urge the judge to make Nebraska Statute 28-1019 part of her sentence. This would mean that she would not be able to own any animal for five years. We must continue to keep this in the public eye and not let her sentencing go under the radar, therefore we will hold another demonstration the day of the sentencing. November 15th, we will hold another demonstration in front of the Lancaster County Courthouse. All individuals, shelters and rescue groups are invited to participate. We would like to see as strong of a turnout as possible to send a message to the judge that this animal abuser should no longer be allowed to have animals. 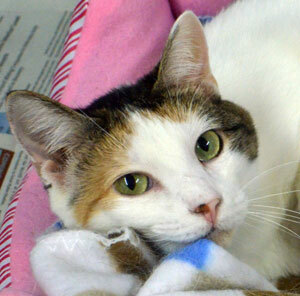 Nebraska Humane Society, the group responsible for putting 28-1019 on the books, will be joining us. Please RSVP only if you plan to attend the event in person. That way we can get an accurate count for signs needed. You can RSVP on our Facebook Events pages or email lori@hua.org. EVENT DETAILS – Demonstration & Attend Sentencing – November 15th 8:30 am to Noon (sentencing at approximately 10:30 am courtroom 22) - CLICK HERE TO RSVP on our Facebook Events Page, or email lori@hua.org. 1) Wear an HUA shirt (or shelter or rescue group of your choice) if you have one. 2) The demonstration will be peaceful - no profanity or threats to harm people or property. 3) Please stay on public property (the sidewalks) but step back onto the grass if people need to pass by. Allow room for pedestrians by making sure not to bunch up too closely with other protestors. 4) Media spokespersons for HUA are Lori Hook and Carol Wheeler. Feel free to give your personal opinion but please refer the media to Lori or Carol for official statements from HUA. 5) Please use the signs that HUA brings for you unless you have a sign approved in advance by Lori lori@hua.org. Authorities had been battling with Ms Hudson for months over the filthy conditions at her facility and the condition of the dogs. While she agreed to surrender 19 of the dogs to Hearts United for Animals in April, that only represented half. The rest are still there, suffering, and it has been reported that she is back up to as many as 35 dogs total. Conditions cited included inadequate shelter, inadequate food and water supply, and inches of feces in the ramshackle little shanty that many of the dogs were housed in. 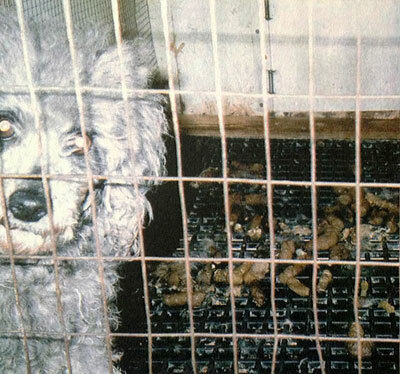 The larger dogs, Standard Poodles, had no shelter at all. Cats, cats, cats! Everywhere we look there are cats and kittens. Hearts United for Animals has had to expand the cat quarters, making temporary housing in the clinic building as well as some of our isolation areas. It was a very tough season for kittens. We have many babies in addition to the adult cats. They showed up in boxes at the end of the driveway, farmers brought them in from the area, some were found under houses and in fields. They are all friendly, sweet, adorable and cuddly and oh so happy to be rescued! They would love to have forever homes, and the staff at HUA would love to be back into their 'cat comfort zone' and get some adopted so that overcrowding is not an issue. If you are considering adopting a cat now is a wonderful time. Now through the end of the year you will receive a Hearts United for Animals tote bag with top of the line Taste of the Wild cat food, toys and treats. The cats and kittens are able to travel long distance as well. Just write to us at hua@hua.org to find out about all of the lovely cats for adoption and discuss travel arrangements. Shyanne, pictured here, was rescued from a small town where people noticed her wandering around lost for weeks. She has only three legs. She is one of the sweetest cats we have ever met. Her very favorite thing is to snuggle in soft beds. 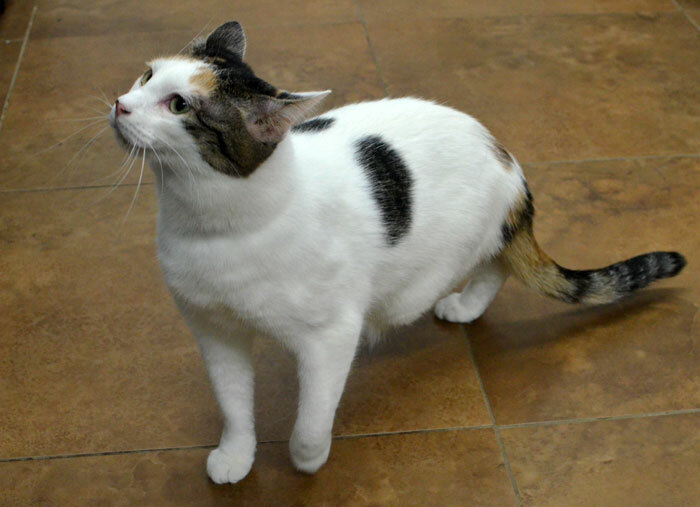 She and her cat friends at HUA would love a home of their own with people to snuggle with and care for them forever. Please spread the word about Shyanne and her friends.